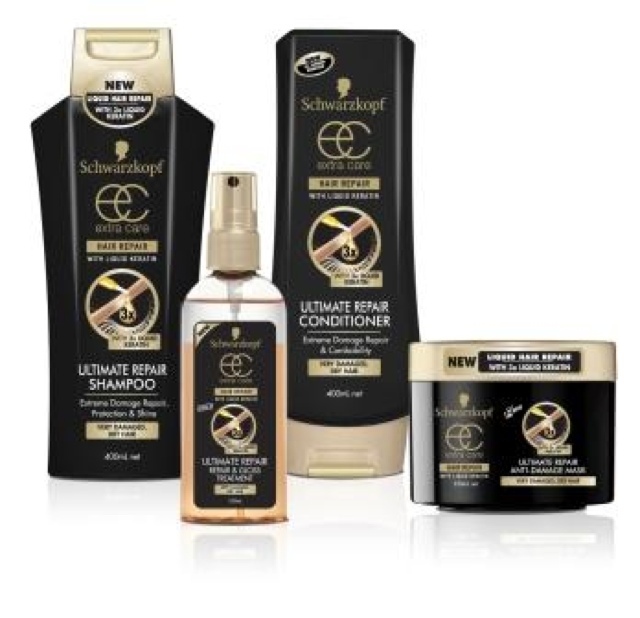 Wear + Tear: FIRST IMPRESSIONS: Schwarzkopf Liquid Keratin range. FIRST IMPRESSIONS: Schwarzkopf Liquid Keratin range. Just tried this shampoo, conditioner and mask. I'm an avid purchaser of all kinds of hair products, both high-end salon brands and 'drug store' or supermarket brands. When I used to dye my own hair black/chocolate brown I used Schwarzkopf and was very happy with the results. Currently having heavily bleached hair means I'm always looking to try new products that can protect or 'mend' my hair issues such as dryness and breakage. My hair is definitely not as thick as it would be if it was my natural colour or a more natural shade. I have a lot (and I mean LOT) of hair breakage and haven't really done anything different to manage the issue lately. My shampoo and conditioner are generally more focused on the colour maintenance of my hair rather than condition. I want to try and prevent more hair breakage as my hair is getting longer and I don't want to have to cut it shorter once it's beyond repair. So I went to Priceline today and was going to buy a hair treatment or mask and looked at several products that cost $20-30. For $26 I ended up getting shampoo, conditioner and a tub of mask by Schwarzkopf because I figured it would hit the problem hard. The range is called Ultimate Repair Anti Breakage Liquid Keratin with 3 x Keratin. The packaging is sleek and black and listed all the symptoms suffered by my poor candy locks. These are my first impressions. Wow. The feeling of my usual shampoos which are either deep cleansing or gentle, leaves my hair thirsty and ready for conditioner. This shampoo is completely different. Lathers beautifully and almost starts to detangle my hair as I wash. It feels like silk and once I rinse it out, the feeling doesn't wash away. Quite subtle and not too slimy, this conditioner further detangles my hair and I don't end up with the usual fall-out of hair from combing it through with my fingers. This mask smells, looks and feels like body butter. I left it on for 1-2 minutes (how the hell are you supposed to tell the time in the shower?) and rinsed it out. My hair was at this point completely tangle free and soft. Before brushing, I removed most of the hair from my hair brush to do a test. I've just brushed my towel-dried hair as I usually would and instead of a big clump of hair left in the brush, there's about 3 small hairs. Wow. I will have to see how my hair is once air-dried and perhaps a few days after treatment, but this stuff may be a miracle product!